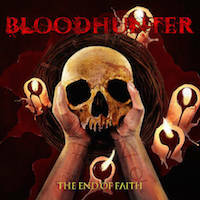 For those fans that miss Angela Gossow in ARCH ENEMY, should listen to BLOODHUNTER’s new album, “The End Of Faith.” It will not disappoint. After all, BLOODHUNTER is fronted by Diva Satanica herself. Her vocals are brutal, raw, and refreshing. Alissa White-Gluz better take notes. BloodHunter hails from Spain since 2008 and is a rising beast in death metal. “The End of Faith” is a fantastic album, which is set to release on October 16th, 2017 and is BLOODHUNTER’s second full-length album. Many listeners will want more from BLOODHUNTER after listening to it. Like ARCH ENEMY’s albums, “The End of Faith” begins with an instrumental called, “The Forbidden Zone” to set the mood. It instantly captivates the listener. It has a MORS PRINCIPIUM EST influence to it. The rest of the album flows smoothly leaving the listener completely satisfied. BLOODHUNTER is not shy and listeners will welcome them with open arms. They invoke the listener’s eardrums with distinctive bass lines, flawless guitar shreds, lively solos, and aggressive rhythms that intrigue and make your head continuously bang. Their lyrics are filled with dark imagery entwined with words of wisdom. They aren’t afraid to unleash what they have to offer. “The End of Faith”, “Eyes Wide Open”, and “Still Standing Up”, are strong tracks on the album. These songs give the listener insight into the band’s power. All of the tracks are intense and filled with elements of death metal and melodic texture. “The Queen Beast” must be a reflection of Diva Satanica. It delivers brutal punches and breakdowns. “Let The Storm Come” sets the bar. It is absolutely amazing. ARCH ENEMY, when fronted by both Johan Liivas and Angela Gossow couldn’t compare. The album winds down with “Possessed by Myself,” which has melodic death metal ebb to it and finishes with the Death cover, “Crystal Mountain.” If metal fans are looking for the new fix, “The End of Faith” is the album to indulge in. You will be addicted. You will be ravenous for more.